1. I can't wait for the new season of The Walking Dead on television. There are actually alot of shows I like even better than The Walking Dead, but I'm anxiously awaiting to find out who was killed at the end of last season. 2. In my home, the carpets need to be repaired. Well, actually they need to be replaced, not repaired, but I couldn't come up with anything else. 3. I thought I lost my mind, but the weekend is here so I'm slowly finding it again. 4. Once, I found my cats, my life has been much happier. Glad you are finding your mind too. Can you believe I have never seen The Walking Dead? Someday I will binge watch it all. Have a great weekend! I love your answer to #4, about critters. I truly would be lost without their unconditional love. 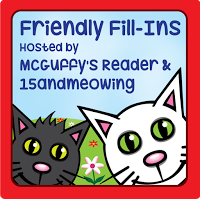 Thanks for being a part of Friendly Fill-Ins! Hugs! Fun meme! Yvonne, I enjoyed reading your fill-ins. Have a relaxing weekend.